Metro DC Lawn and Garden Blog: Eco-friendly gardeners say "Let me tell you about my garden critters"
Eco-friendly gardeners say "Let me tell you about my garden critters"
While some people our age are walking around saying "Let me tell you about my grandchildren", my hubby and I are just as proud to brag about our cute "grand critters". Since we began creating our eco-friendly landscape ten years ago, the critters are just as anxious to visit us as kids are to visit their super generous, gift-giving grandparents. But rather than spoiling "the kids" with cell phones, new clothes and multi-media devices, our "babies" are content with a little food and a roof over their heads. We built and hung this new nest box when we saw a screech owl hanging out in a larger nestbox we have on our property. It only took THREE days before the little screecher found the box and moved right in. We saw him (or her) hanging out at the box on and off for a few days and then didn't see him (or her) again for awhile. So we were really surprised when, exactly two months after hanging the box, we saw two screech owl babies. "The grand kids" only hung around a few days, and then they were gone, but it is SO much fun to hear them out there at night, calling to each other, and know that we played a part in helping to "raise them". You don't really have to work that hard to attract wildlife to your eco-friendly landscape. Once you begin adding native plants and eliminating chemicals, the wildlife will find you. But below are ten tips to keep in mind if you want to share your landscape with the local wildlife. You can read the full post about creating wildlife friendly landscapes by following this link. 1) Choose plants that provide food for birds and wildlife. 4) Provide a water supply. 5) Provide shelter for wildlife. 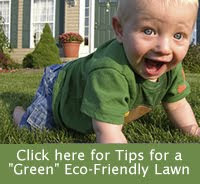 6) Avoid chemicals in your landscape! Chemicals can harm wildlife as well as the insects that they eat. 7) Garden with care. Many birds and other creatures raise their young in low bushes and shrubs. Butterflies raise their young (caterpillars) on some of our favorite garden plants. Mow, prune and trim with caution to avoid critter catastrophes. 8 ) Keep wandering pets out of wildlife areas. 9) Provide Places to Raise Young. 10) Practice eco-friendly gardening. Everything you do in your landscape can have an effect on the overall health of the soil, air, water and habitat for native wildlife. Visit the Metro DC Lawn and Garden blog often to learn how to create a landscape that is healthy for you and for local wildlife. This is fantastic, Betsy! Great photos, too. I bet having some screech owls around helps out with any pest problems you might have. I am so lucky to be married to a woman that gets every bit as excited as I do about spotting a young praying mantis, and we spend evenings in our back yard enjoying not only the birds and garden plants, but also the parade of other garden residents like spiders and insects that call our little urban farm "home". It sure beats cable TV! Hi Kyle. My husband and I love showing each other "wonders of nature". May sound corny, but like you said, it sure beats TV! The composting pod cast will air during the weeks of June 15 through June 29 and the pod cast on pollinators will air beginning the week of June 29 through July 13. I hope the pod casts are fun and interesting (and brief). If you listen to one, let me know what you think. Thank you!! Awesome post and great photos of the owls!